Welcome to the last stop of The Classics Circuit tour for Georgette Heyer and my review of Lady of Quality. Annis Wychwood is a spinster at 29 and enjoying her freedom. She is excessively wealthy which enables her to live on her own in Bath. When she encounters a young runaway heiress on the road from her brother's house, she takes the lady under her wing. Unfortunately, the girl's rakish uncle, Oliver Carleton, isn't very keen on the idea of his niece staying with Annis. Annis finds that Oliver brings out the fighter in her. Whenever they are together, sparks fly. I usually love Heyer's books but I wasn't quite as enamored with Lady of Quality . I think most of my feelings were derived from my dislike of Carleton. He really didn't do it for me. I just found him rude, especially when he talked about his former mistresses. He was cold-hearted about them. It burned my buttons. Still, Heyer's writing is like champagne, bubbly and sparkly, yet dry (humour) and too much can make you light headed. I enjoyed the host of characters around Annis: Lucilla, Ninian, Geoffrey, and Lady Wychwood. I could have done with less Maria though. 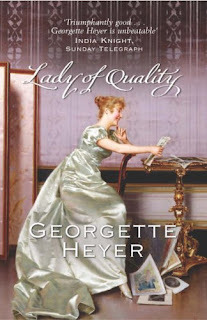 Lady of Quality did not displace Cotillion as my favorite Heyer novel but it was still enjoyable. This was the last of Heyer's Regency romances to be published. I believe I won this from another blogger- possibly Bookfool? Maybe? It was a long time ago. Merci!